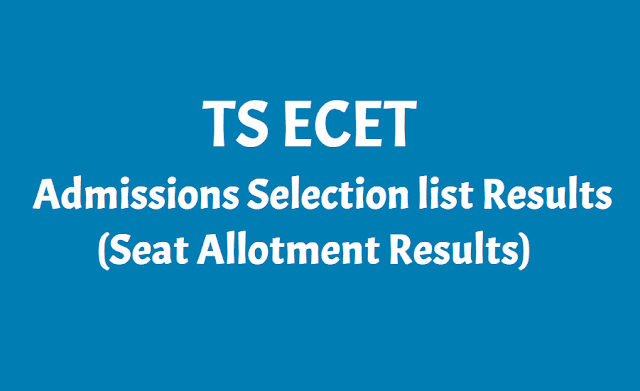 TS ECET 2019 Spot Admissions Selection list results, Seat allotment results, Eligibility Criteria: The candidates are hereby informed that the left over vacancies in Private unaided Engineering colleges will be filled by the Institutional spot admissions held at the respective colleges. The candidates desirous to seek admission are informed to contact the Principal of the respective institutions. - Candidate shall present with all original certificates for spot admissions. Candidates without original certificates are not permitted for spot admissions. - Fee reimbursement is not applicable to the candidates admitted Under Institutional Spot Admissions. - Candidates can verify for the available vacancies duly verifying with institution profile and college wise allotment details. - Candidates who have not taken admission so far are only eligible. Candidates shall not be allowed for spot admission without original certificates. - The vacancies are to be filled first with those qualified in TSECET-2019 and possessing 44.5% and above (for OC) and 39.5% and above for (BC/SC/ST) in the relevant Diploma/B.Sc. Examination. - If the vacancies are still left, Candidates who have passed Diploma/B.Sc. Examination with 44.5 % and above (OC), 39.5% and above (BC/SC/ST) are to be considered. - Candidates who satisfy the definition of Local/Non-Local shall alone be granted admission. - Candidates whose diploma is from other state but either of the parents resided for a period of 10 years in Telangana /A.P state are eligible for Spot Admissions. In such case the Parent Residence certificate issued by competent authority for a period of 10 years shall be produced. - Candidates possessing Diploma Certificates other than those issued by the State Board of Technical Education, Telangana /A.P shall be asked to get the equivalency certificate from Telangana SBTET, HYDERABAD before granting admission. - Eligibility master in the annexure enclosed shall be followed for candidates qualified in TSECET. - For candidates not qualified in TSECET and belonging to Diploma in Electronics and Instrumentation or Diploma in Applied Electronics and Instrumentation shall not be offered ECE branch at degree level as such facility is not extended to qualified candidates as per the Government Orders. For other diploma holders such restriction does not exist. - Candidates who have passed the Three year B.Sc Degree Examination with Mathematics as one of the subject in the group combination from a recognized University in the State or its equivalent examination are only eligible for entry into the relevant courses of Engineering as per G.O. in vogue. All Diploma Holders are to be considered first for available vacancies and thereafter BSc passed candidates for left over vacancies in the Institutional Spot admission. - Residence Certificate, if required.